Royal Manchester Children’s Hospital Charity (RMCH Charity) is hoping to raise over £50,000 towards its Helipad Appeal, with the launch of this year’s Many Hands Campaign, sponsored by Seneca Partners and Ryman Stationery. The campaign, which first launched in 2008, encourages north-west businesses to support the charity by signing up to a fundraising target of £1,000. This year the charity has introduced a shorter campaign which will see Many Hands consolidated into the first quarter of the financial year. All participating businesses are invited to attend the launch event at Manchester’s King Street TownHouse on 22nd March, hosted by BBC presenter, Hugh Ferris. 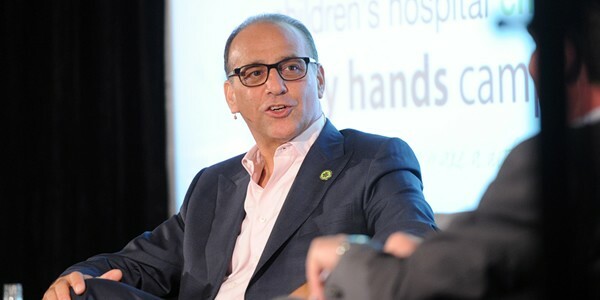 Renowned businessman and long-term supporter of RMCH Charity, Theo Paphitis is spearheading the fundraising campaign for the fourth time. The retail magnate and entrepreneur will take part in a Q&A session at the campaign’s launch event. In the event finale, Theo will again be in attendance to form part of a four-man judging panel to assess all entries, awarding the business which presents the most innovative fundraising idea. This year, Theo will be joined by judges Maurice Watkins CBE, Charity Chairman, Journey9’s Managing Director, Laura Wolfe and Chief Executive of Downtown in Business, Frank McKenna. “Since its launch in 2008, I have been delighted to have been a part of Many Hands. Charity has always been important to me, but what sets this campaign apart is the principle the campaign promotes, that of networking and utilising business connections, which makes commercial sense to me. “Many Hands is a wonderful campaign which encourages companies to compete for the common goal of supporting the largest projects at Royal Manchester Children’s Hospital. This year, money raised will be used to fund our Helipad Appeal, an exciting project which would be very hard to raise funds for from just one individual or company. Monies raised by this year’s campaign will go towards the charity Helipad Appeal at Central Manchester University Hospitals NHS Foundation Trust (CMFT). The Helipad Appeal will enable the creation of a brand-new 24-hour access primary helicopter landing site, the first of its kind in central Manchester. Currently, Royal Manchester Children’s Hospital, along with the Trust’s other hospitals, relies upon a secondary landing site in a nearby park, an arrangement which means that patients initially transported by air ambulance must then be transferred the final mile of their journey by land ambulance. The onsite helipad will allow the Trust to save many more lives and will increase the chances of a full or improved level of recovery in a great many seriously ill or injured patients. The support of Royal Manchester Children’s Hospital Charity means that the hospital can provide additional resources that make life easier for patients and their families who use the hospital.